What better way to spend a few hours than browsing through one of Haarlem’s markets? There is a market to be found every day in Haarlem. Find out about our favourite Haarlem markets here on Visit Haarlem. Perhaps the best known of all of Haarlem’s markets is the Grote Markt (which translates as great market). Located right under the Bavo Cathedral and ringed by terraces and bars, it’s certainly picturesque and entertaining. All manner of things are sold here – from artisanal breads and pies to flowers and plants. And of course clothes, shoes, trinkets and accessories are in abundance. There’s something to please everyone – and every wallet – at this historic Haarlem market. Markets are held on the Grote Markt square on Mondays and Saturdays, from 09h00 to 16h00. The Botermarkt is also located in Haarlem’s city centre, just a few minutes walk from the Grote Markt. It’s not the biggest of markets, but is still very authentic and atmospheric – and is where the locals shop. Markets are held in Botermarkt square 4 days a week – each with a different focus. On Mondays, there’s a large selection of second-hand and vintage clothes on offer. On Wednesdays, the focus is on books and antiques. And on Friday’s you’ll find a wide variety of organic wares for sale in the farmer’s market. Whereas on Saturdays, a general produce market bursts with a wide range of flowers, vegetables, fruit, cheese and bread. The Botermarkt is also lined with terraces and bars, which often catch the afternoon sun – the perfect spot to watch the world go by. Markets are held on the Botermarkt square on Mondays, Wednesdays, Fridays and Saturdays, generally from 09h00 to 16h00. 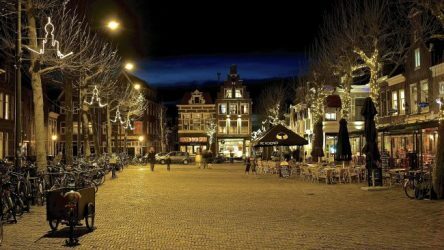 In December, come soak up the charm of Haarlem’s traditional Christmas market, with over 300 stalls and live performances to warm the soul. The market is mostly centred around Haarlem’s Grote Markt square, but activities are held across the city.